FBotD was an American Crow cawing as I scraped the windows on a clear frosty morning. First trip with the Thursday Group since my fall, hooray! 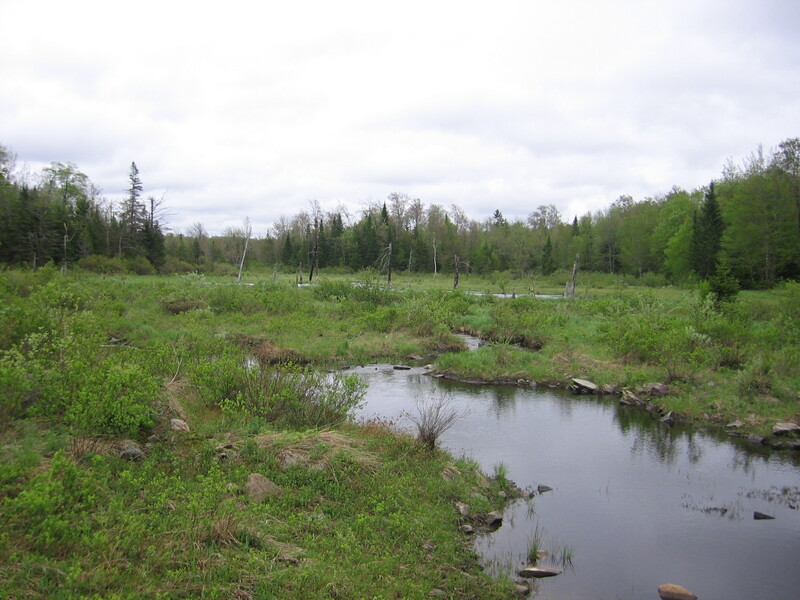 Our destination was open water on the Hudson at Stillwater and points north, and the Ft. Edward grasslands. We headed upriver stopping at boat launches and shuttered fish-fry shacks, where among the Mallards and cross-breeds we saw wintering ducks. A Carolina Wren bubbled and giggled his oversized song. How cold was it in the morning? 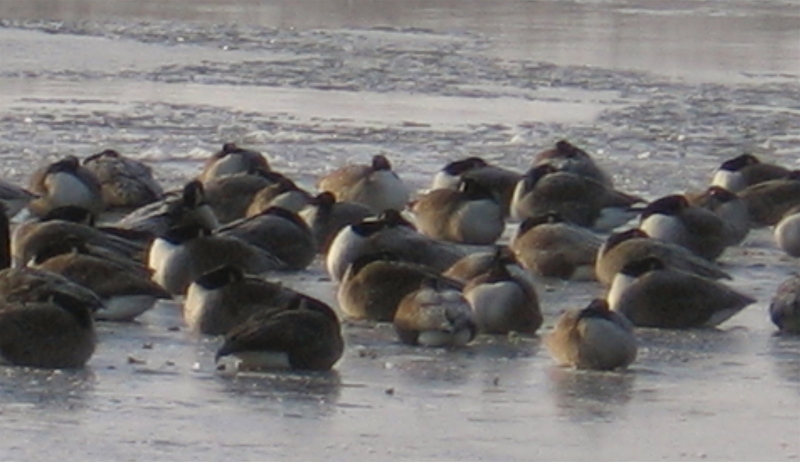 I’ll let these frosted Canada Geese tell the tale. At the dam in Northumberland five flashes of white caught our attention. Two were certainly Snow Geese, but the other smaller three raised a lot of debate. Snow Goose? Ross’s Goose? A crossbreed? They cruised in close formation with the two larger geese, leaving us with photos and questions. Moving on to the grasslands, Rough-legged Hawks gave us excellent looks as did an immature Bald Eagle along the river. The highlights of the day for me were a huge flock of Snow Geese, several hundred at least, rising from the stubble, and the first Horned Larks I’d seen in over 20 years. Common Merganser, Hooded Merganser, Ring-necked Duck, Herring Gull, American Crow, Canada Goose, Ring-billed Gull, Common Goldeneye, European Starling, Rock Pigeon, Carolina Wren, Bufflehead, American Robin, Greater Scaup, Red-tailed Hawk, Mourning Dove, Hairy Woodpecker, Black-capped Chickadee, Dark-eyed Junco, Downy Woodpecker, Red-bellied Woodpecker, White-breasted Nuthatch, Snow Goose, Rough-legged Hawk, Bald Eagle, Eastern Bluebird, Horned Lark, Great Black-backed Gull, Northern Cardinal, American Black Duck, Mallard. 31 species, 10 new for the year, 1 new to this list. 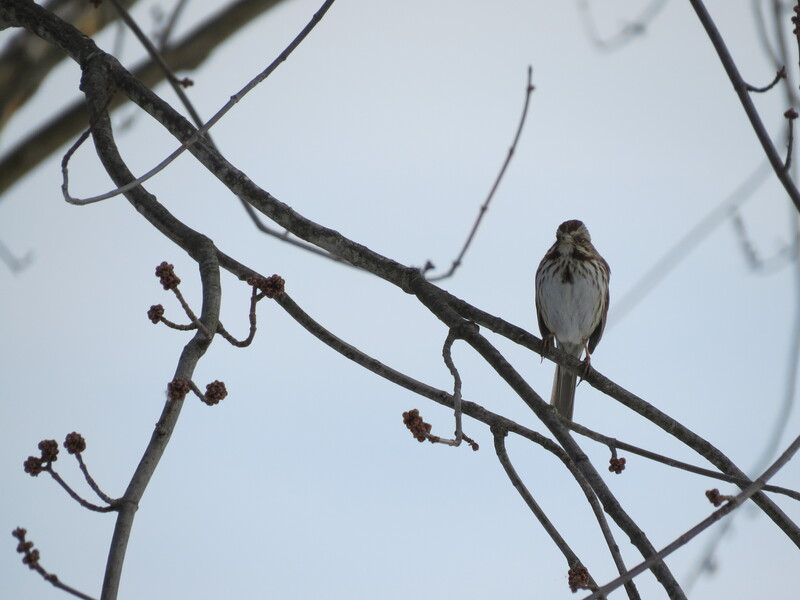 Today was my first birding excursion in over six weeks. It was just a quick drive to Cohoes and Peebles Island, but it felt so good to be out of my yard! I chose the destination because I wanted to see something really impressive to start the year off, and figured a Bald Eagle would fill the bill. Well, the weather has been so mild so far that the Mohawk isn’t frozen yet, so the eagles don’t need to gather at the open water by the falls. We did see one adult soaring, but most of the show was thousands of gulls swirling against the dark clouds like a cyclone of white confetti. 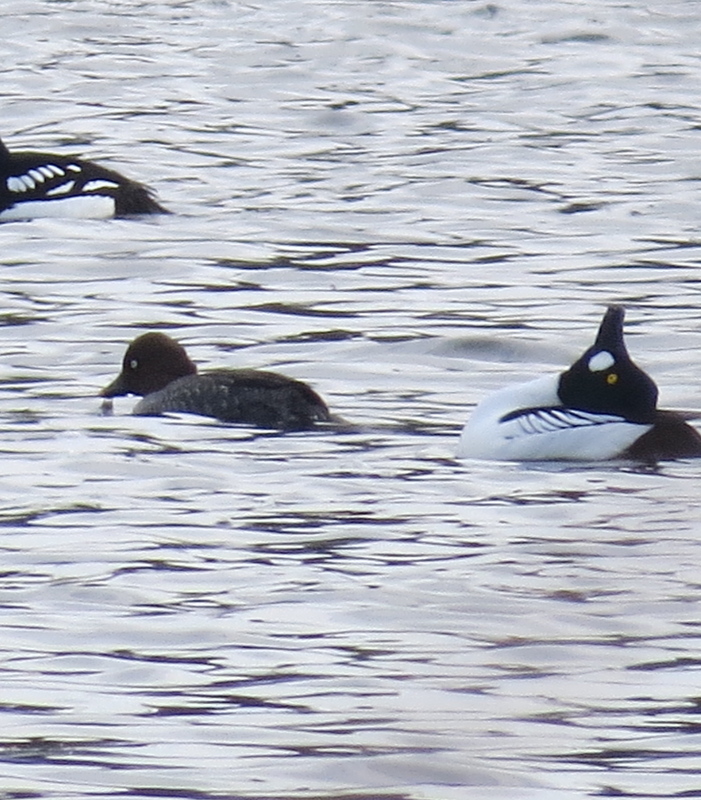 A few ducks and geese in roadside ponds and a soaring Red-tail padded my list, but I was wishing for a WOW bird. We pulled into the parking lot at Peebles Island less than an hour before sunset. We strolled along the river’s edge reminiscing about last year’s floods as a few pigeons zipped by. 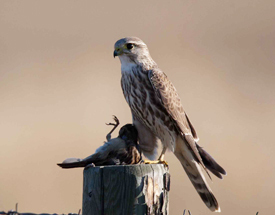 As we leaned on the bridge railing before turning back to the car, a slender-winged shape glided past — a Kestrel, perhaps, but it seemed browner and a bit large. 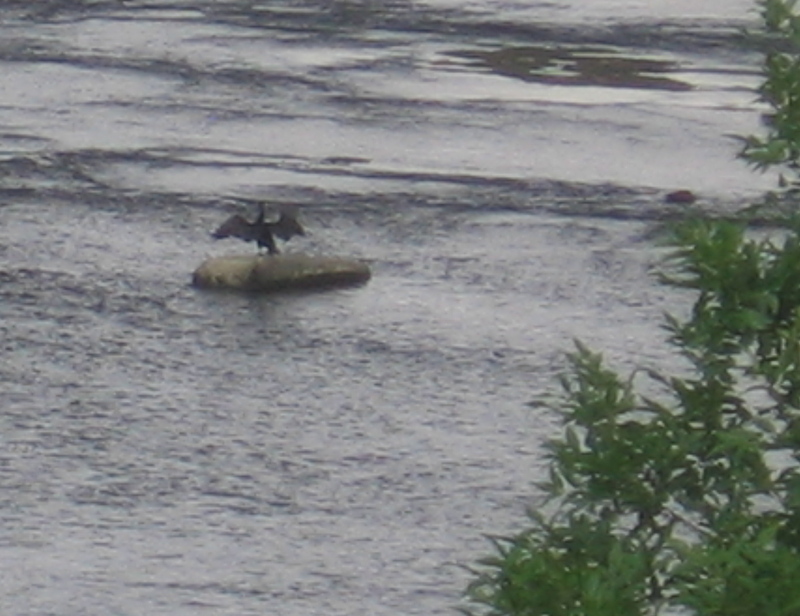 She lit on a dead snag and relaxed, scratching an ear, stretching a wing, extending her tail. I could see then the less-defined falcon eye makeup and sideburns, and the more uniform brown back and darker body, even in the glow of the low sun. I’ve seen Merlins before, but never one at almost eye level, 100 feet away, and perching unfazed by passing cars, dogs, and nuthatches. We watched her until the sun was setting. Oh, for a better camera! At home: Dark-eyed Junco, Black-capped Chickadee, Downy Woodpecker, White-breasted Nuthatch, American Crow, Blue Jay, American Goldfinch, European Starling, Tufted Titmouse, Red-bellied Woodpecker. At Peebles Island/Cohoes: Common Merganser, Red-tailed Hawk, Bald Eagle, Ring-billed Gull, Great Black-backed Gull, Herring Gull, Rock Pigeon, House Sparrow, Canada Goose, Mallard, Merlin. 21 species, 11 new for the year. *In The Sword In the Stone, part of young Wart’s training to become King Arthur is magical transformation into all sorts of living things. He spends a night in the castle mews in the shape of a merlin, listening to the barracks-talk of the birds. 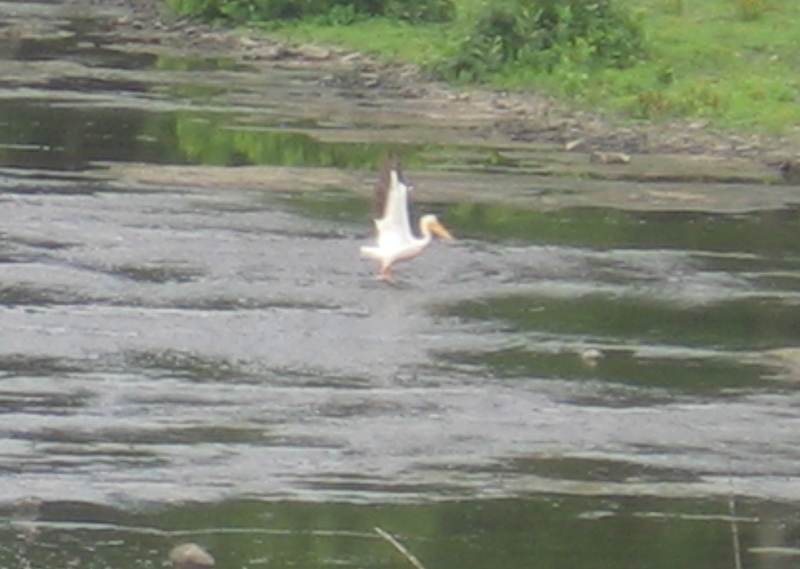 On August 8, reports started coming in to the Hudson-Mohawk Bird Club that an American White Pelican had been spotted at Cohoes Flats. Needless to say, this provoked a lot of interest and we decided this was a bird we couldn’t pass up. A lone Pelican may show up in our area once in five or ten years — we are way out of this species’ normal range. Did this one follow the coast, then the Hudson, north from Georgia, or did it meander over from the midwest? We met other birders at Cohoes, all equipped with binocs, scopes, cameras — but the pelican hadn’t gotten the memo and was not to be seen. Bill and I drove over to Peebles Island to look from a different vantage point, and when we came to the point of the island overlooking the flats, there it was! 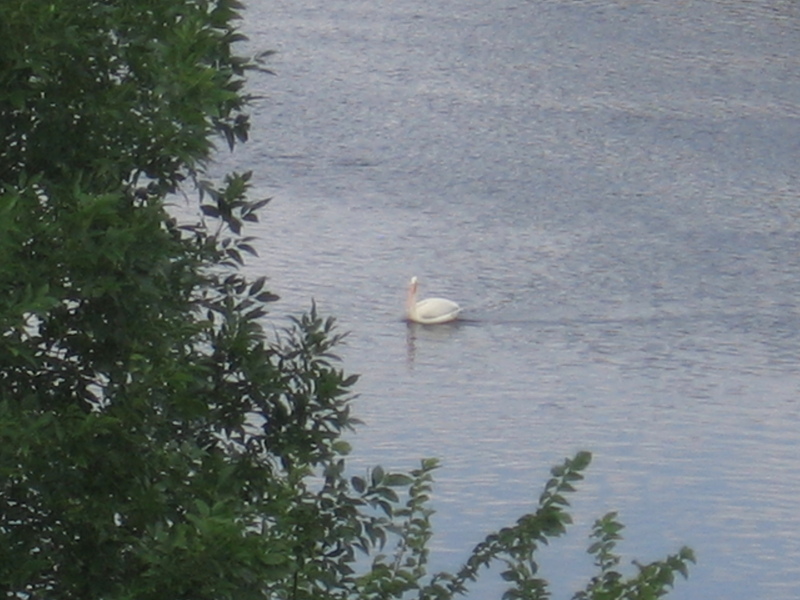 From a distance you could mistake it for a swan, until it turned and we could see the massive beak and pouch. It put on quite a show for us, moving from the open water near the spillway to the shallows paddling between rocks and flying short distances, preening and eating. Once it stood quite near a Great Blue Heron, letting us see it was nearly as tall as the heron, and much bulkier. I really enjoyed getting such a great viewing experience. 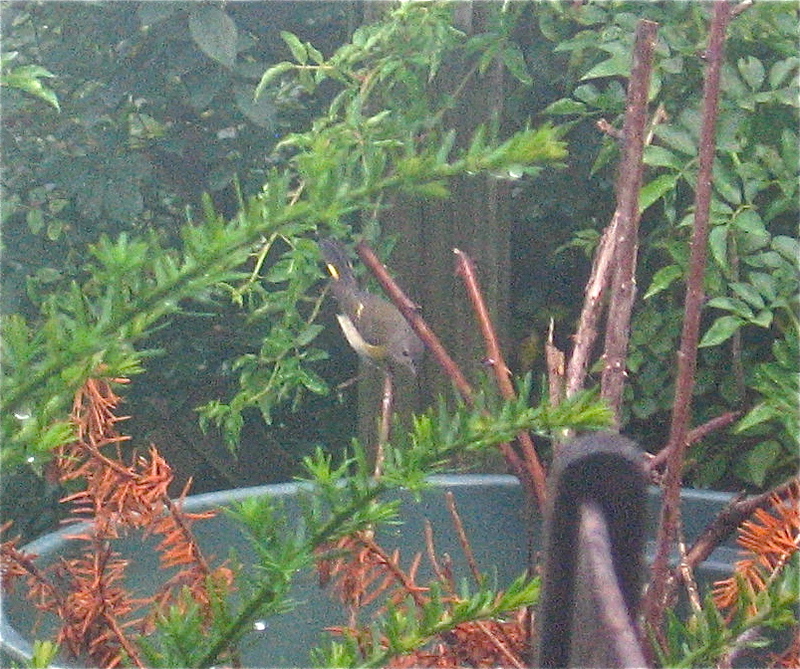 Click here for some better pictures, and if you have no objection to Yahoo Groups, I suggest you check out HMBirds. We have some very talented photographers in the group with the skill and gear for incredible shots of the pelican and plenty of other birds. Big White stuck around for the whole month of August, sometimes hiding for a few hours but always returning to the same convenient- for-viewing spot, until Hurricane Irene dropped a foot of water on everything. The raging floods have calmed since Sunday but the river is still chocolate-milkshake brown with a county’s worth of rich topsoil scoured off. No more calm shallows with easily-seen fish. I hope our bird headed off south to the rest of his kind. Cherry Plain State Park is a wonderful place to visit in the summer. Up on the Rensselaer Plateau, it’s always cooler than in the valley. The water of Black River Pond is clear but deeply tannic, and even in August it’s as cold as any lake in Maine. The old dirt roads crisscrossing the park have funky names: Jiggs Highway, Pesticide Shack Road, Dynamite Shack Road. In June I walked there with the Bird Club, looking for the last of the migrants passing through and some species who usually nest further north but consider these hills an acceptable substitute. The weather was not optimal for treetop-peering (grey skies being something of a leitmotif this year), starting in a drizzle that faded soon, though the sky remained overcast. We had excellent birders-by-ear with us, and the woods were full of sound. Two male Blackburnian Warblers challenged each other across a field, their firethroats glowing. Black-throated Blue warblers buzzed an ascending tzee-zeee-zee, while Black-throated Green’s was zee-zee-zee-zoo-zee! And the everlasting omnipresent Red-eyed Vireo monologued: “Here I am. Where are you? Right here. Vireo?” As soon as we moved out of range, another took up the chant. By early afternoon, we gathered together to total up our count. 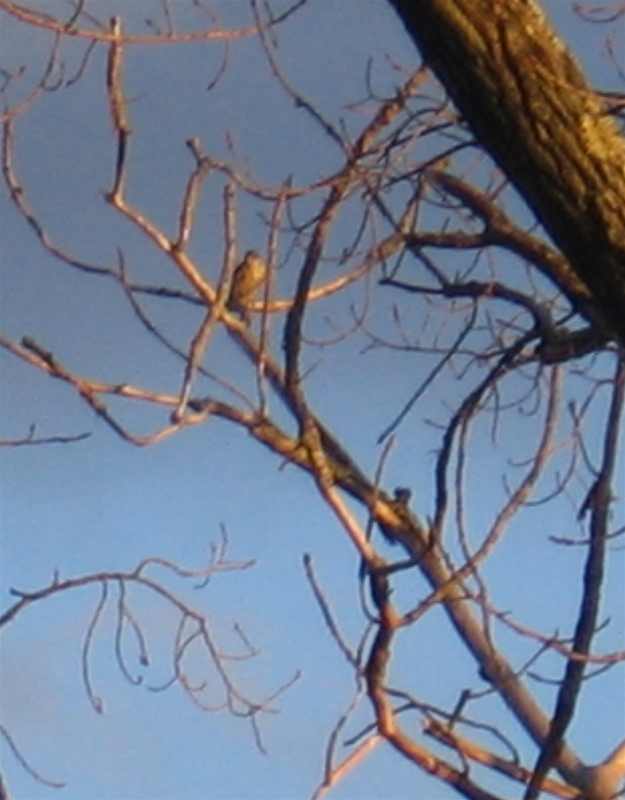 As we added the last bird to our lists ( a calling White-throated Sparrow, gone from my yard since April), someone spotted a Broad-winged Hawk, distinguished from the commoner Red-tail by the broad white band across its tail. It had no sooner soared off when an adult Bald Eagle flew low and leisurely over us. As I walked back to the car, I heard an almost indescribable sound. Howling, yelping, croaking — three Common Ravens burst out of the trees circling, swooping, diving at each other. Whether they were driving off an intruder or just rough-housing, I’ll never know. Great Blue Heron, Turkey Vulture, Bald Eagle, Broad-winged Hawk, Ruby-throated Hummingbird, Yellow-bellied Sapsucker, Northern Flicker, Pileated Woodpecker, Least Flycatcher, Red-eyed Vireo, Blue Jay, Common Raven, Tree Swallow, Barn Swallow, Black-capped Chickadee, Red-breasted Nuthatch, Veery, Hermit Thrush, American Robin, Gray Catbird, Cedar Waxwing, Yellow Warbler, Chestnut-sided Warbler, Magnolia Warbler, Black-throated Blue Warbler, Yellow-rumped Warbler, Black-throated Green Warbler, Blackburnian Warbler, American Redstart, Ovenbird, Common Yellowthroat, Chipping Sparrow, Song Sparrow, White-throated Sparrow, Northern Cardinal, Rose-breasted Grosbeak, Red-winged Blackbird, Common Grackle, Purple Finch, American Goldfinch. 40 species seen, 6 new to this list. Two months later the woods were quiet. It was all about fungi and butterflies this time. When it comes to mushrooms, I know puffballs and the ones you find in the supermarket. But I love to see the variety of wild mushrooms as fall approaches, their fantastic colors and forms. Here are a few. The little falls were running high after heavy rain. You can see how clear yet how amber the water is, like a flood in a brewery. 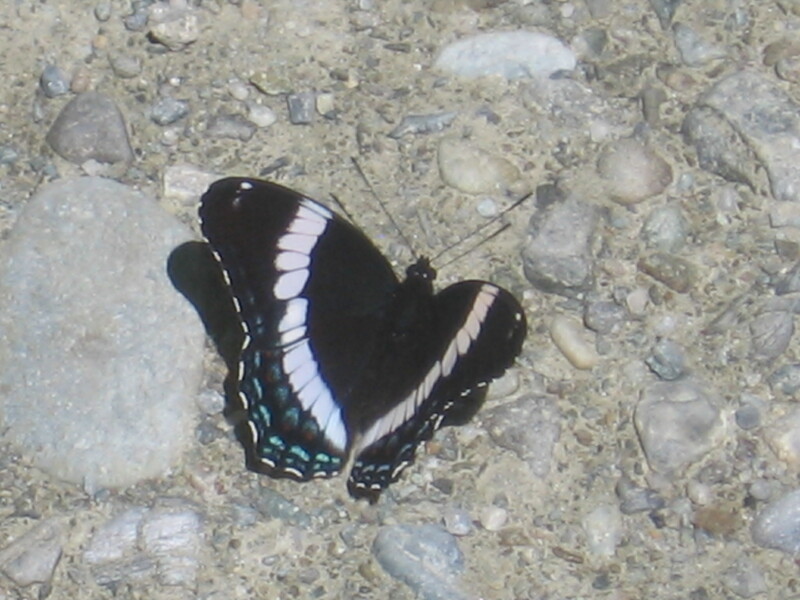 These stunning butterflies were everywhere on the sunny road, tasting the gravel. 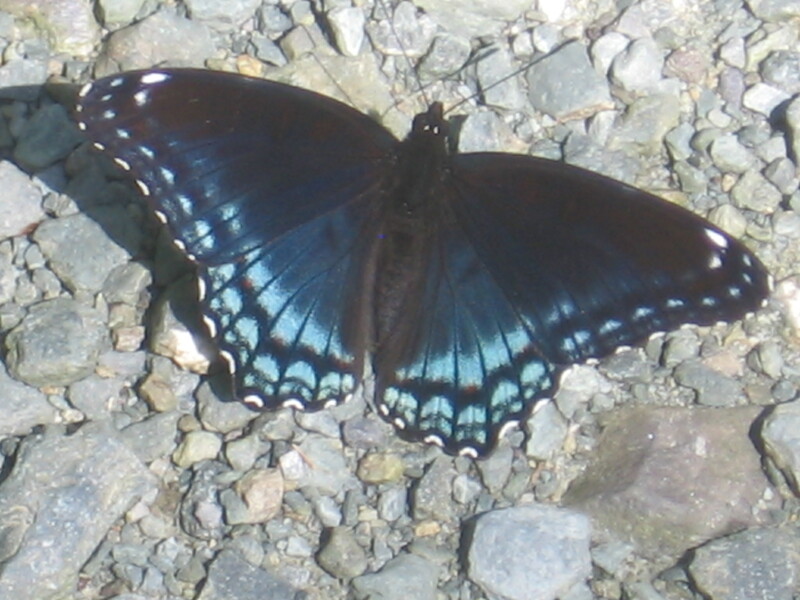 These are both ‘forms’ of Limenitis arthemis, formerly considered to be different species. Astyanax is the more southern variety, while the Ad-mee-ral (I have to say it with Khan’s accent) is commoner up north. Along the dividing line which must be in upstate NY, they hybridize freely. 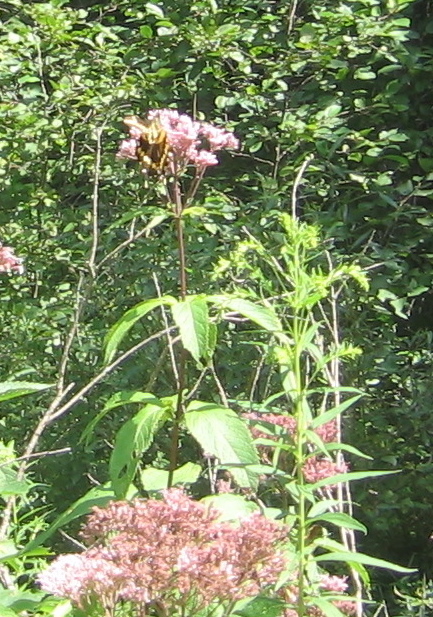 A flash of brilliant black and yellow caught my eye in a stand of Joe-pye Weed. 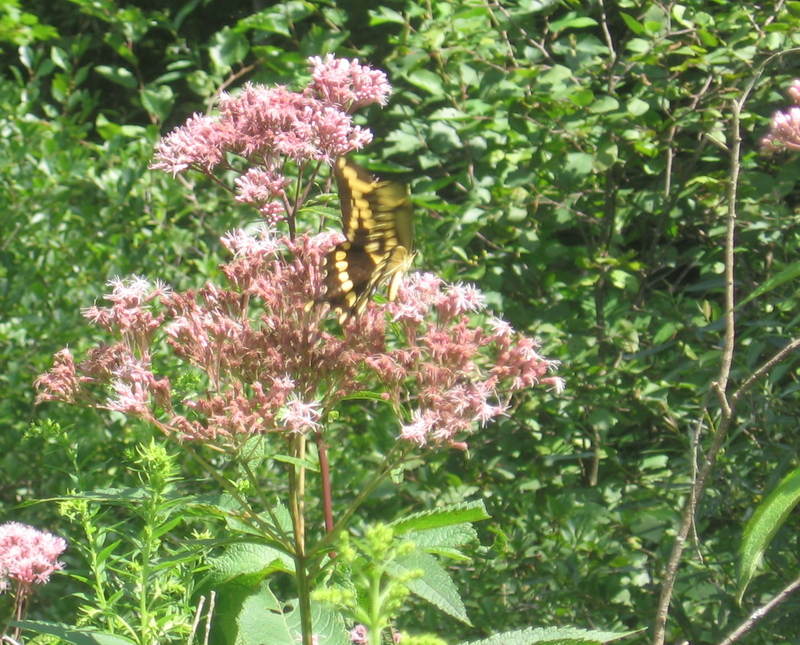 I thought at first it was a Tiger Swallowtail, but it was larger and more solidly black, with a broad yellow crossbar and yellow fringes to the wings. Its body was pale with no striping. When I got home I pored over my field guides and the internet, concluding that it was a Giant Swallowtail, uncommon for this area. Giant indeed — I’d say its wingspan, extended, was the length of my open hand. The camera’s batteries were crapping out, so I could only get a few shots and hope for the best. Hmmm, maybe I’ll add butterfly-watching — or is it butterflying? — to my obsessions.